So I'm slowly getting back into the cooking, I've used some faux meats here but at least there is some chopping involved!! This was inspired by a salad Jamie Oliver did on his Jamie Does... program. He was in Andalucia and made a tomato and chorizo salad which looked delicious, well, minus the fatty meat and excessive amount of olive oil used ;-) I remember seeing that Redwood foods made vegan chorizo chunks and decided to have a go. The recipe is not online anywhere that I can see but it was pretty straightforward: tomatoes, garlic, olive oil, sherry vinegar, parsley, chorizo and salt and pepper. I first made the salad and it was so, so good!! The vegan chorizo chunks when fried in olive oil release amazing spicy flavour and colour making an fantastic dressing with the vinegar. You simply pour the fried chorizo and garlic over a big bowl of roughly chopped tomatoes with some spring onion and parsley and toss. Served with crusty french bread you have a delicious lunch! 150g good quality tomatoes, you want to splurge here! Roughly chop the tomatoes and place in a bowl. If making the salad add the spring onion and parsley and gently toss. If making the pasta start cooking the pasta. Heat the olive oil in a frying pan until fairly hot. Add the chorizo and fry until very fragrant and the oil changes colour, a couple of minutes. Add the sliced garlic and fry a couple minutes more, I like to get the garlic here just slightly golden as I love the flavour that way, and I do eat them with the dish, you could leave them out if you like and just use them to flavour the oil, but I recommend leaving them in. Now add the vinegar and fry about 1 minute more, it will sizzle up then calm down. Using a rubber spatula scrape it all over your tomatoes and toss, season well with salt and pepper. 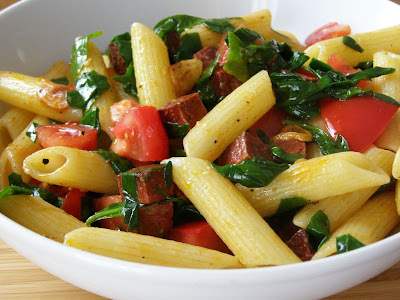 If making the pasta simply add the drained pasta to the chorizo and oil and gently fry with the tomatoes and spinach until it wilts. Lovely with a little grating of mature cheddar cheezly on top too! Wow, that looks amazing! 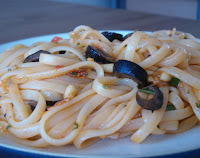 I'm craving pasta like mad these days and I could make that dish with a batch of chorizo from Viva Vegan. Awesome! Thanks for the comments! That's great to know the recipe is in Bella, I'll have to pick that up - thanks! !